Olivier Giroud became France's third highest goalscorer of all time as he scored in an easy win over Iceland. 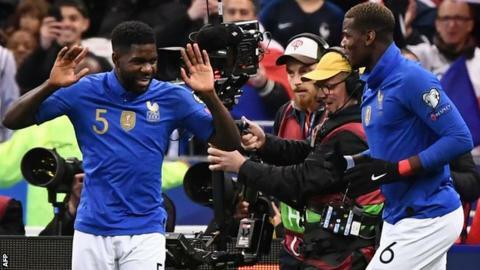 Samuel Umtiti put the hosts ahead with a glancing header from Kylian Mbappe's left-wing cross, before Giroud saw the ball bounce off him and into the net following Benjamin Pavard's cross. Mbappe added a third from Antoine Griezmann's pass, before Griezmann netted a fourth shortly afterwards. Giroud, 32, has now scored 35 times in 89 international appearances. The Chelsea striker's 68th-minute goal had a touch of fortune about it as Pavard's cross was palmed out by Iceland goalkeeper Hannes Halldorsson hit Giroud and went in. Nevertheless, the goal took him clear of David Trezeguet's total of 34, with only Michel Platini (41 goals in 72 appearances) and Thierry Henry (51 goals in 123 matches) ahead of him. France have now scored eight goals in two qualifying games for the 2020 European Championship, having beaten Moldova 4-1 in their opening qualifier on Friday. Didier Deschamps' side lead Group H on goal difference, ahead of Turkey, who also have six points from their two games. Match ends, France 4, Iceland 0. Second Half ends, France 4, Iceland 0. Kylian Mbappé (France) wins a free kick on the left wing. Antoine Griezmann (France) is shown the yellow card. Aron Gunnarsson (Iceland) wins a free kick in the attacking half. Substitution, France. Moussa Sissoko replaces Olivier Giroud. Attempt missed. Thomas Lemar (France) left footed shot from outside the box is too high. Substitution, France. Presnel Kimpembe replaces Layvin Kurzawa. Goal! France 4, Iceland 0. Antoine Griezmann (France) left footed shot from the right side of the box to the bottom left corner. Assisted by Kylian Mbappé. Substitution, Iceland. Ari Freyr Skúlason replaces Birkir Már Saevarsson. Foul by Kylian Mbappé (France). Ragnar Sigurdsson (Iceland) wins a free kick in the defensive half. Attempt saved. Gylfi Sigurdsson (Iceland) right footed shot from the centre of the box is saved in the centre of the goal. Assisted by Arnór Ingvi Traustason with a cross. Thomas Lemar (France) wins a free kick on the left wing. Foul by Aron Gunnarsson (Iceland). Substitution, France. Thomas Lemar replaces N'Golo Kanté. Offside, Iceland. Aron Gunnarsson tries a through ball, but Alfred Finnbogason is caught offside. Goal! France 3, Iceland 0. Kylian Mbappé (France) right footed shot from the centre of the box to the bottom right corner. Assisted by Antoine Griezmann with a through ball. Offside, France. Paul Pogba tries a through ball, but Layvin Kurzawa is caught offside. Offside, France. Antoine Griezmann tries a through ball, but Olivier Giroud is caught offside. Paul Pogba (France) wins a free kick in the attacking half. Foul by Olivier Giroud (France). Birkir Már Saevarsson (Iceland) wins a free kick in the defensive half. Offside, France. Paul Pogba tries a through ball, but Benjamin Pavard is caught offside. Offside, Iceland. Arnór Ingvi Traustason tries a through ball, but Alfred Finnbogason is caught offside. Goal! France 2, Iceland 0. Olivier Giroud (France) left footed shot from very close range to the centre of the goal. Assisted by Benjamin Pavard with a cross. Attempt missed. Olivier Giroud (France) left footed shot from a difficult angle on the right is just a bit too high. Assisted by Paul Pogba. Attempt missed. Blaise Matuidi (France) left footed shot from outside the box is high and wide to the left. Assisted by Paul Pogba. Substitution, Iceland. Alfred Finnbogason replaces Albert Gudmundsson. Attempt missed. Antoine Griezmann (France) left footed shot from outside the box is too high. Attempt missed. Benjamin Pavard (France) right footed shot from outside the box is close, but misses to the left following a corner. Substitution, Iceland. Arnór Ingvi Traustason replaces Runar Mar Sigurjonsson because of an injury. Delay in match Runar Mar Sigurjonsson (Iceland) because of an injury. Corner, France. Conceded by Sverrir Ingason. Foul by Layvin Kurzawa (France).